This I have no idea, may even be a weed, but I cannot find anything like it anywhere else on the property. Not sure on the 1st one, but the second one looks like a marigold plant. I don't beleive its a heliopsis unless it is a double, but it looks more like a dahlia. I didn't think dahlias got that big, or were perennials where I live...none of my dahlias have ever survived the winter. The yellow flower is over 6 feet tall. Do these leaves look like your yellow flower leaves? 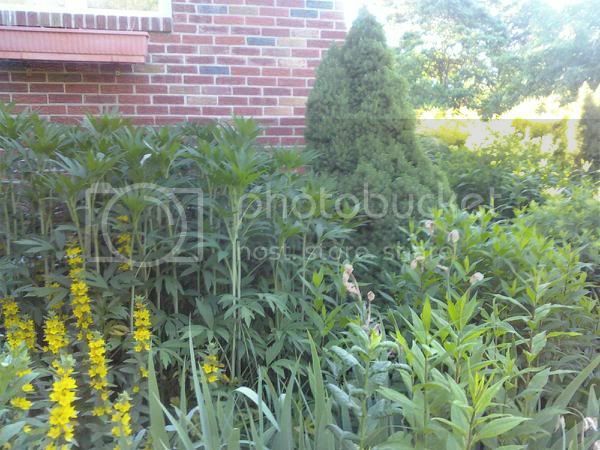 The yellow flowers in the photo do not go with the plant in question. The tall plant along the brick, when in bloom (now), has yellow pom-pom type flowers like the one in your photo. I have no idea what it is; it came with the house. I have tried to get rid of it a few times, but it always comes back. mtmickey, mighty that second one be elder? !potatoes! elder is a possibility, I will investigate that one a bit more. 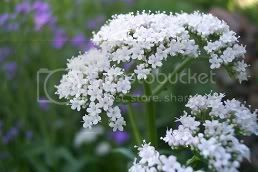 mtmickey your second picture is 'valeriana officialis' grows up over 5' with a umbrella cluster of perfumed white flowers. That is how they start out but change given in height. Sorry, I need to work on the sharing pictures to show you. shadylane...would love to see some of your pics. Here are the instructions for posting pics. I did look it up online and you may be right, I took better pics last night and will see if I can get them posted tonight...I have a few more things that need id too. Love the knowledge found here. The first appearance with a few leaves it then will become fuller. You will notice a change in the leaves as they will not look like the first stage and later a thick stalk will grow upwards. 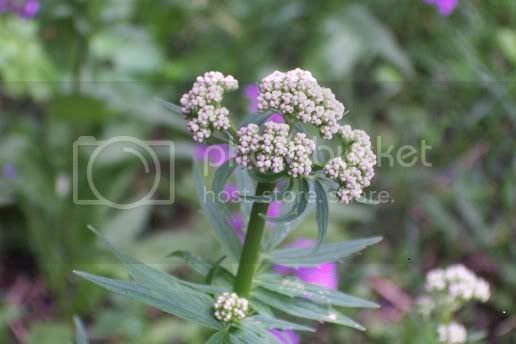 Small cluster of buds form and they will bloom small but later bloom into a large umbrella form with a outstanding fragrance. thanks for the pics shadylane...that sure looks like them, but how long do they take to proceed through growth? They have not grown much at all this summer, and I'm sure they are not going to get to flowering before winter hits us, we do have a pretty short growing season...another month or so and we will have frost. Your welcome mtmickey, I wish I would have taken better steps in making a garden journal. That way I could give a sound ground answer to their growing lengths but the best I could do for you is to give you what I have observed here in zone 5. 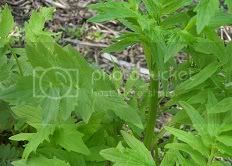 In early spring (mid month of May) you will notice the fern like growth. Come June they will develop the stalk and flower head. 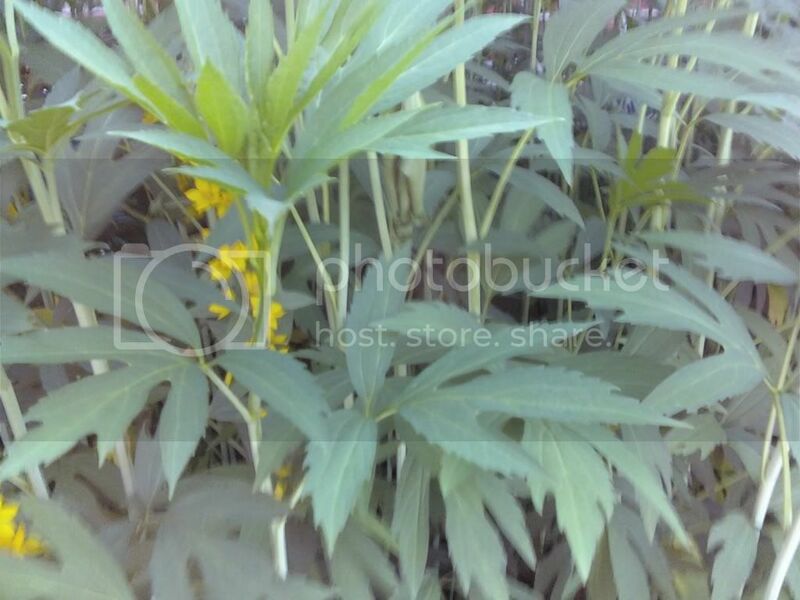 They seem to grow very rapid with a stalk appearing and their foliage changing. They bloom in mid summer for about two to three weeks and start to seed quickly. Is it possiable that we are speaking of two different plants, for you should have seen results by now. 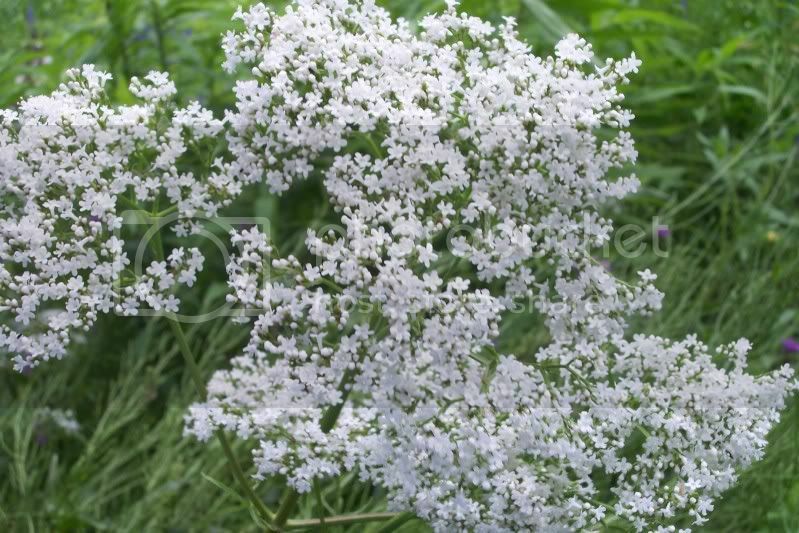 Found another full bloom picture of the 'Valeriana officialis', I do need to get organized. But in the back ground of the picture there are 'dames rocket' finished blooming and starting seed. So perhaps that will give you a time in early summer as when they bloom. Sorry that I could not be more of help to you. Thanks for the pics shadylane. They sure look like the pics you posted, but did not ever produce blooms or flower. I finally pulled a bunch out yesterday, left one to see what it does. The seem to spread by pretty thick runner roots. Do you have any idea what the roots look like? Thanks for your help. They are growing elsewhere on the property here and there,not close together. They spread by seed, I don't think they grow as runners, but may seem like that since they tend and known to over crowd other plants. 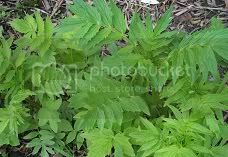 I have not thought to pull any up, but as a herb the root can be harvested in fall and it's oils are used as a seditive for treating insomnia.. It may be that your plants have not yet established maturely to produce blooms. Next year you may see results.